PfizerAnimal Health releases Dectomax Injectable solution, a ready-to-use, colourless to pale yellow, sterile solution containing 1% w/v Doramectin (10 mg/mL). In cattle, Dectomax is formulated to deliver the recommended dosage (200 mcg/kg of body weight) when given by subcutaneous (SC) injection at the rate of 1mL/50 kg of body weight. 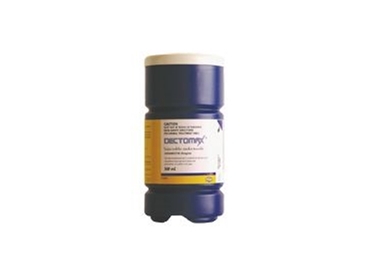 Dectomax injectable solution is indicated for the treatment and control of gastrointestinal roundworms, lungworms, sucking lice, biting lice, cattle tick and mange mites. Consult your veterinarian for assistance in the diagnosis, treatment, and control of parasitism. The control of the following harmful species of gastrointestinal roundworms, lungworms, sucking lice, biting lice, cattle tick and mange mites. Consult your veterinarian for assistance in the diagnosis, treatment, and control of parasitism.